It is the 1950s and a shadow has fallen across the Earth! A massive Alien Armada has come from the deepest reaches of space with a single goal… to conquer the planet! Hot on the heels of Invasion from Outer Space comes Conquest of Planet Earth: The Space Alien Game, another thematic luckfest pile of boardgaming fun from Flying Frog Games. It’s the first time they’ve used illustration instead of photography, and though I think they missed the chance to do a really cool 50s-looking ‘Atomic Age’ design, the game is a lot of fun. 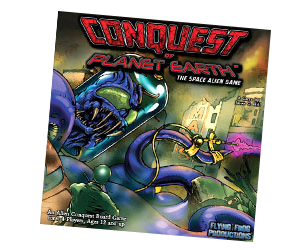 Conquest of Planet Earth: The Space Alien Game is a little bit different from other Flying Frog releases, and may have been somwwhat overlooked because it was released very close to their other game that features invading aliens, Invasion From Outer Space. That and Flying Frog’s other games share a similar graphic style (retouched photos of actors instead of illustrations) and style of play (characters move about a map playing thematic cards and fighting). Conquest of Planet Earth, however, though there’s still a heavy reliance on cardplay and combat, features colourful, cartoony art instead of photos. You choose an alien race (your ‘character’ in the game) that has several special abilities, and begin the game with four flying saucers on your landing site. The board is made up of a central board and one board for each player, each divided into seven locations. During your turn you secretly bid for how many Action points you will spend during the turn, and the player bidding the least number becomes first player. You can then spend Action points on your turn, moving your saucers to other locations, replacing destroyed saucers, buying tokens to fuel special abilities, or playing event cards that cost Action points to play. When your saucers move to a new location, you draw a Location card, which may represent anything from a military base to a small town to empty countryside. If there is a Resistance value on the location, you draw Resistance cards one at a time, in number equal to the value, fighting each card as it is turned up in an attempt to conquer the location. Depending on how populous the location is, you get Terror points for a conquered location. The rules themselves are pretty basic and easy to pick up; but where this game really shines is the fantastic variety of Event cards and ‘Space Stuff’ cards, that cover probably just about every alien invasion B-movie situation you can think of—and then some. You can drop an Atomic Bomb on a location to clear it of rival aliens; spread a Contagion to wipe out the human resistance; try Eating Kittens (‘Now that’s just wrong!’) to increase your Terror level; or play We Come in Peace to automatically win a fight. 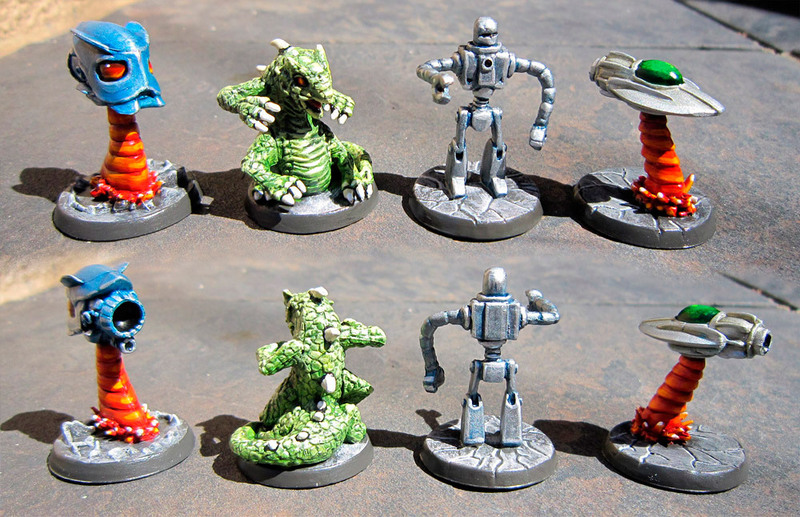 You might be joined by a Giant Robot ally in your quest to conquer the humans, use Disintegration Beams or a Death Ray to increase your fight strength; or deploy a Massive Blob to fight for you. The game is hilarious and fun, comes with rules for both Cooperative and Competitive play, and you can even play solo. This summary includes rules from the Apocalypse expansion. And just tell me that eating kittens isn’t the single greatest way to win this game. It is impossible to do so. I wish I’d had a chance to play it more before I moved and it went into storage; I really enjoyed my one play of it! Another one that needs some expansion love. Thanks again.